The Visitors is hands down the best piece of performance art we've ever seen. Nine musicians across nine screens with varying instruments play and sing along to an hour long melody that ebbs and flows beautifully. Just writing those lyrics gives us goosebumps even though we've seen this piece four times before. 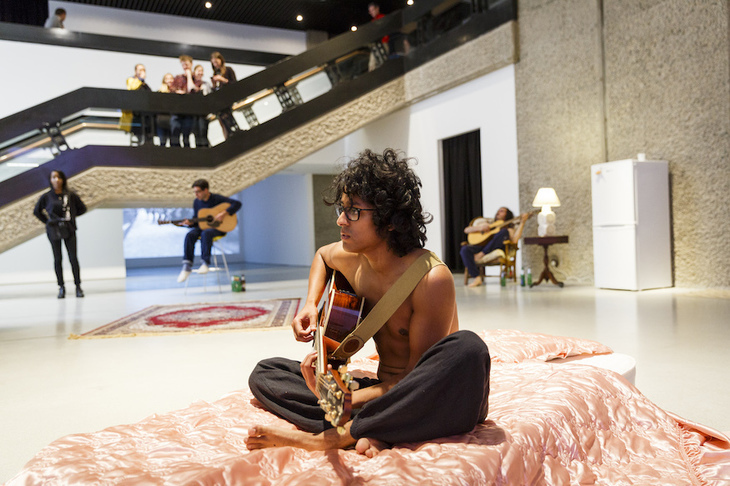 It was on last year in a Brewer Street car park and it's back to form the centrepiece for a solo show by Icelandic performance artist Ragnar Kjartansson at Barbican art gallery. Two women in period dress kiss for three hours. Who is more uncomfortable, us or them? This is just one of many lengthy endurance performances on view at this show. 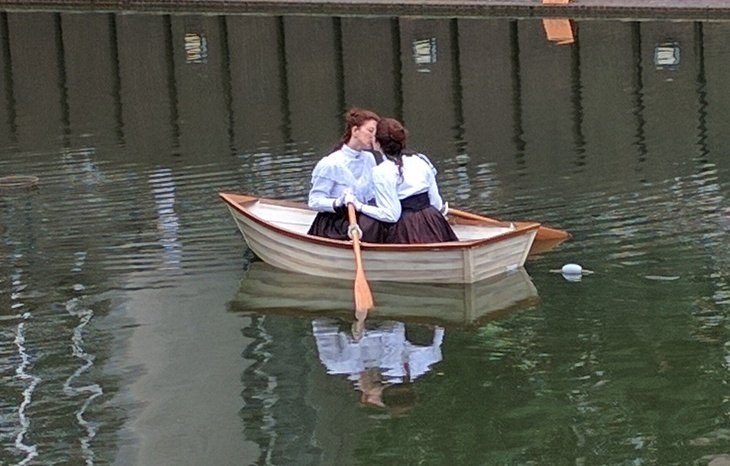 Every weekend two women, in period dress, will sit in a rowing boat in the middle of the Barbican lake. They then proceed to kiss for three hours — sounds more tiring than romantic. Are they more uncomfortable performing than the discomfiture we feel watching? These sorts of playful and challenging questions are at the core of Kjartansson's work. On a similar level there's a film of a six hour performance as the same song is performed over and over again by one band with no breaks. It's impressive how the quality doesn't deteriorate. It's helped by the fact that it's a very catchy tune. Kjartansson questions what performance is. Is it just a one off event that loses its power after one watch? Does knowing it is repetitive make it any less powerful? Does knowing the length of a piece make us more susceptible to stick with it? All questions that will have different answers for different visitors, but get to the very heart of some of the challenges around performance art and how we experience it. Walking into the gallery to find what we would classify as a 'hipster den' brought a smile to our faces as men with guitars, surrounded by empty beer bottles, strum along to what feels like an impromptu melody with no beginning or end. This performance lasts the entire length of the exhibition's opening hours. Too often performance art is a drawn out concept with no payoff for the audience, while all of Kjartansson's work is a joy to watch and listen to. We had the pleasure to watch him perform live and the fact that he doesn't take himself too seriously, and his ear for an 'earworm' of a composition, is arguably what makes his work so accessible. The paintings aren't so impressive but the artist insists they are an important part of his practice. If the performances we saw are the end result, then paint on, we say. Is Ragnar Kjartansson a musician, an artist or a performer. Who cares, when the end result is such pure joy to experience. 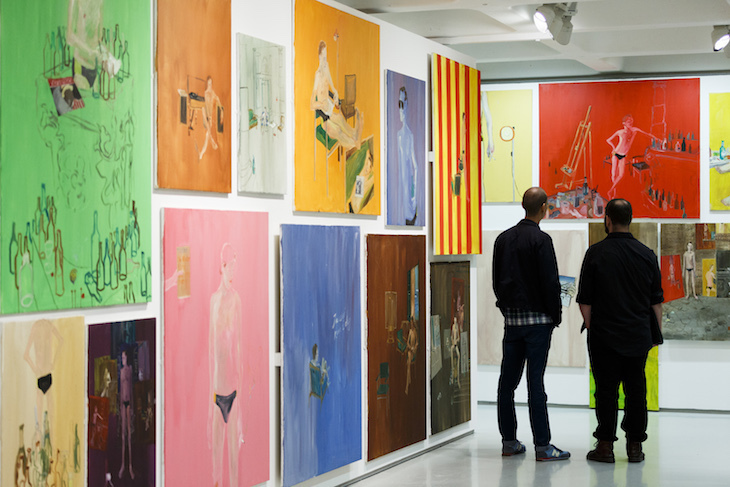 Ragnar Kjartansson is on at Barbican Art Gallery until 4 September. Tickets are £12 for adults, concessions available.